Hoodview Vending is an independent vending operation located in the Portland, Oregon area. 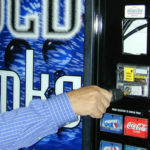 Bob Hill, owner, is an active member of NAVA (Northwest Vending Association) and owns hundreds of vending machines in locations throughout the metropolitan area. Hoodview was experiencing external loss from many of their machines due to unauthorized key duplication. Thieves are able to purchase key blanks from a variety of sources such as the Internet. They then make duplicates to gain access to the machines–and the money. Hoodview has found that their CyberLock system has other advantages and uses as well. For example, it compliments the GPS systems on the trucks very well for driver accountability, time studies, and route efficiency. Also, they have recently begun using CyberLocks for other purposes starting with doors in their office complex. "CyberLock eliminated our losses due to unauthorized key duplication; the system quickly paid for itself."